For my second Dollar Tree Halloween Costume Series I wanted to create a design with supplies that were unconventional to the Halloween/craft sections. Thinking of items that the Dollar Tree will most likely have year round if you were to wait till the last minute to make your costume or if you are a cosplayer year round. My son has been learning about Roman history at school and was talking about the gods and goddesses often. 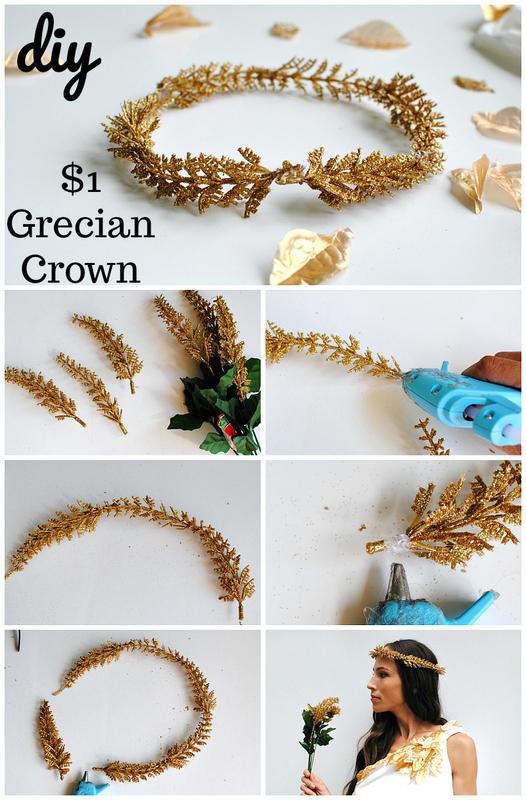 It inspired me to create a Greek Goddess costume. Now the Dollar Tree doesn't sell yardage of fabric or sheets so I had to think "unconventional." Browsing the aisles I came across a shower curtain. This did the trick and looked even better then I thought it would. If you're into fashion like me, I was watching clips from Paris Fashion week and this vinyl like fabric was all over the runways. Another good point is if someone spills a drink on you it will just wipe right off. 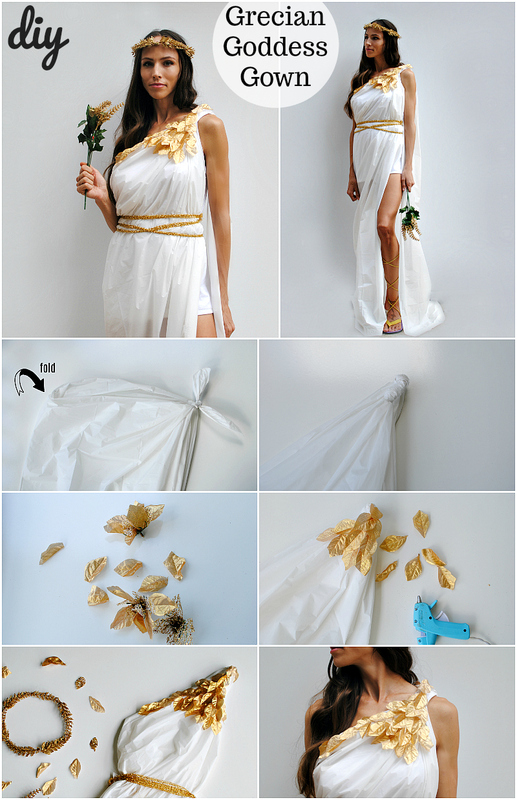 Especially good for those "toga" parties that are so popular. 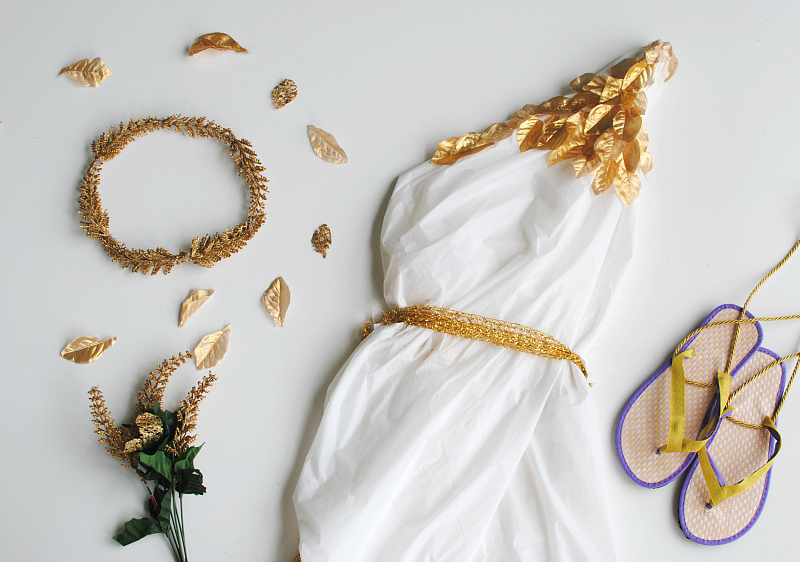 This costume comes complete with a Goddess Crown, Gladiator sandals, and a embellished gown all for a total of 6 supplies = $6. 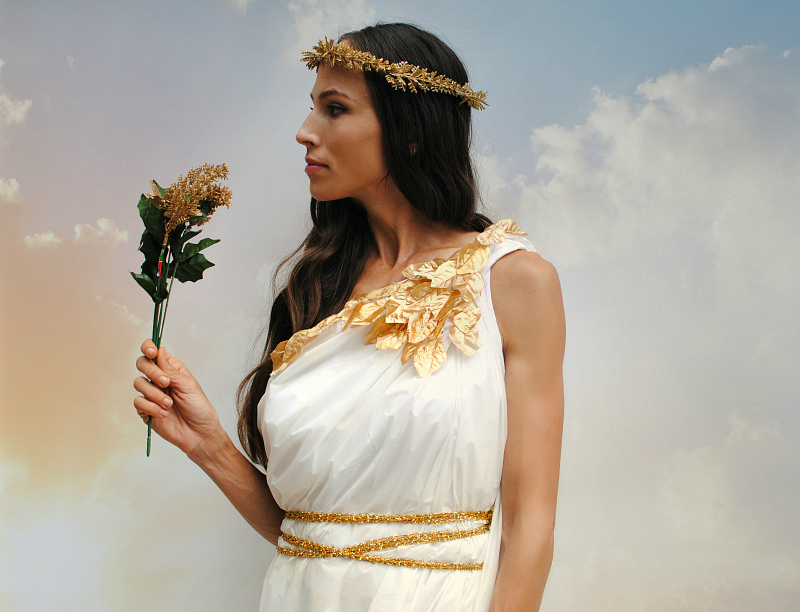 Get the details below to make your own Greek Goddess costume. 2 bouquets of flowers: (Christmas Decor): here & the other one was not available online but all my local DT's have them. (optional) t-shirt: everyone has an extra t-shirt laying around, BUT the Dollar Tree does sell blank t-shirts too. Begin by folding your curtain in half long ways and knot the 2 corners. Then wrap the additional pieces around and dab a bit of glue to hold in place. Remove the petals from the bouquet and cut them into separate leaves. Dab a bit of glue on the end and begin creating a pattern down the front (and back optional). Continue till you get your desired pattern. Add ribbon around the waist to secure the costume into place. Be sure to wear a slip or t-shirt underneath. You can also wear it so the knotted part wraps around the neckline as a halter and it's more of a cloak. Just tie the ribbon to create the waistline. The curtain was see through so I used a t-shirt for a liner. 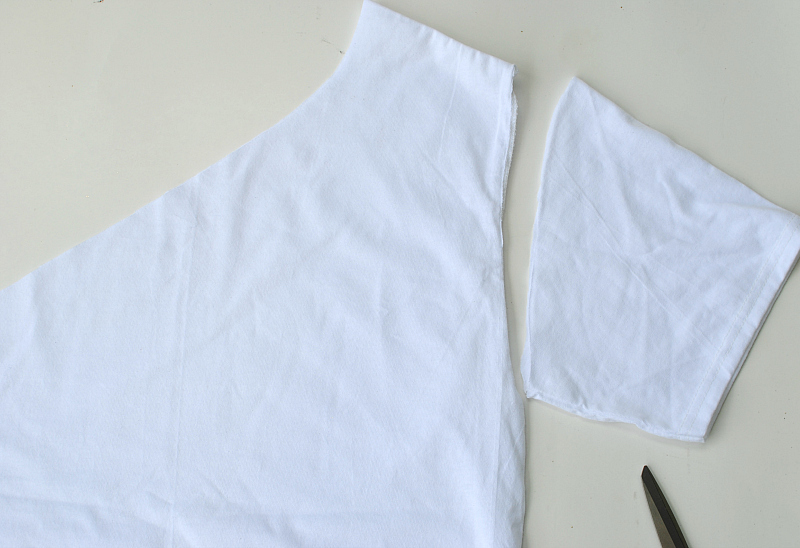 Cut from the underarm up to where the collar and shoulder seam meet. You can then fold over the raw edges 1/2" and sew a hem. Remove the thistles from the Christmas bouquet. They have a natural curve so I formed them into a circle. Dab a bit of glue at the end of each thistle and attach the next piece and so on. Secure in the middle once it's all wrapped around. 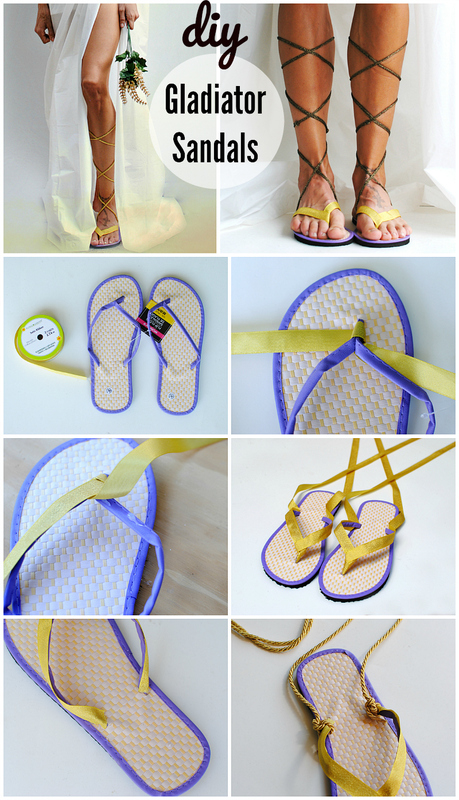 Tie a set of ribbon around the front of the flip flop strap. Then twist it to wrap around to the top part of the straps and secure with hot glue. Just a dab every 1/2 " should do. Once you get to the bottom, cut the remaining ribbon and secure it down with hot glue. Tie another set of rope or ribbon (1-2 yards depending on the length you want) around the bottom of the straps or wrap the midpoint of the ribbon around your arch and secure them by wrapping around your legs to the desired height. I love how this turned out and all for just $6.00. In collaboration with the Dollar Tree. You always pot something new and cool too. I think that it's a great hobby. But still, education is in the first place. https://pro-essay-writer.com/blog/synthesis-essay will help you with writing synthesis essay. Wow, her dress is beautiful and unique, combined with the sandals is great. Damn!! You look stunning gorgeous in this outfit.